You must be a member of the Doha Volleyball Group to attend this activity. Would you like to join this group? 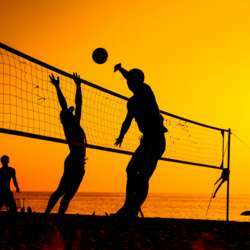 Our Beach Volleyball game is for those who know how to play or looking to improving their skills, meeting new people, having fun and staying active! - Friends are welcome but please let us know their names and invite them to join the group. - If for some reason you cannot join, please CANCEL your attendance in advance so that other players can join (participation is capped). We aim to be not more than 12 people from this group as we have one more group joining us (FB).